He's been a dutiful husband of late, stepping in for wife Victoria Beckham when her UN goodwill ambassador duties forced her to miss the opening of her flagship store in London. And so who could blame David Beckham for rewarding himself with a little shopping spree as he stepped out in Paris on Tuesday. But true to form, the 39-year-old wasn't just looking for goodies for himself. Instead, the doting father was buying a little treat for his three-year-old daughter Harper from fashionable French store Bonpoint. Looking handsome as ever, the former footballer wore a simple white shirt rolled up to the elbows, putting his tattooed forearms on full display. In a nod to his European location, he threw a casual grey jumper across his shoulders, and finished off his look with a pair of black trainers and black jeans. 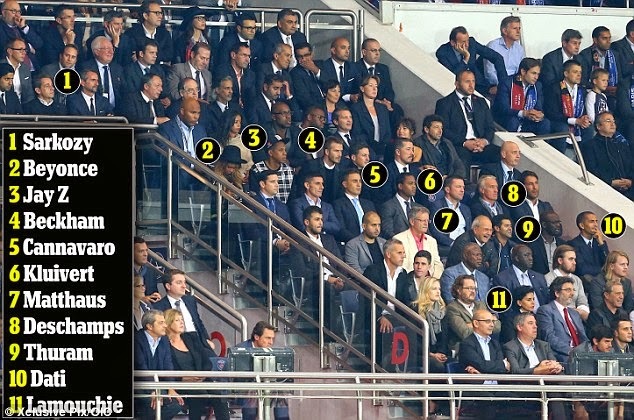 Once the present buying was dealt with, former Paris Saint-Germain midfielder Becks joined a host of A-list stars to watch his old side beat Barcelona at the Parc des Princes. The father-of-four, who ended his career after a brief spell with the French club in 2013, was with music star couple Jay Z and Beyonce in the posh seats. While David and Jay Z chatted up a storm, Beyonce looked rather disinterested in the Champions League match. The singer was left struggling to hold in her yawns as she tried to keep up with the action being played out on the pitch. Meanwhile, David's return to the Parc des Princes stadium was bound to be emotional, as it was there that he broke down in tears as he retired from his beloved sport back in May. At the time, he said: 'I just feel that it's the right time. I feel that I've achieved everything that I could in my career. I wanted to go out as a champion.